Fascicle I was once presumably held in the monastic library of Lorsch. Bound together with fascicle I are several, not easily identifiable parts : Foll. 30-35 (Aldhelmus, De virginitate), foll. 36-47 (particularly computistic and liturgical texts) and foll. 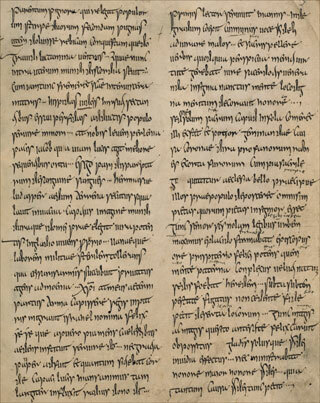 62-67 (computistic texts) were composed around the first half of the 10th century in a certain (Gandersheim ?) or at several different scriptoria. Foll. 48-61 (Iohannes Scottus Eriugena, Glossemata de Prudentio) was written around the first third of the 10th century in Corvey.Presumably only a part of the manuscript (foll. 4-29) was kept in the monastic library of Abbey Lorsch.